The Golden Section, or Divine Proportion, has a long history. It is found in art, science …in plant growth and in Gothic Cathedrals; in human DNA and the pyramids. 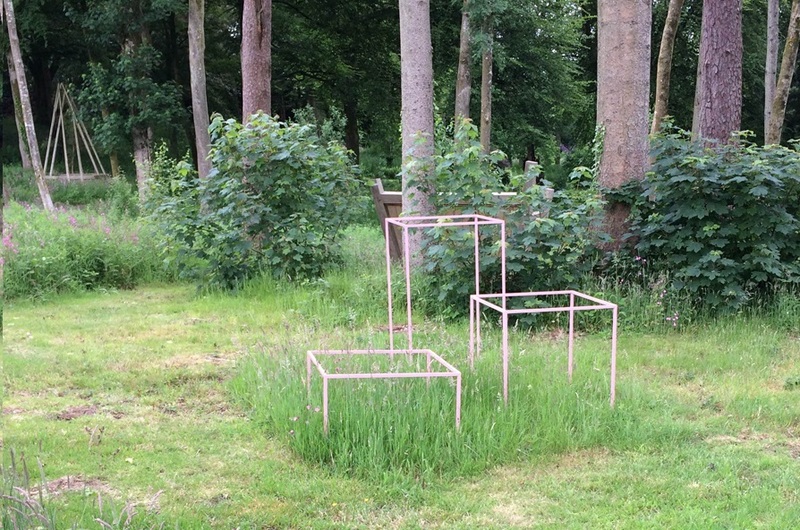 In this sculpture Clare examines the relationship between geometry and nature. The sculptures consist of a larger golden section cuboid and the square and smaller golden section from which it is constructed. They are made of powder coated steel in a bright, pale pink to stand out against the light green surroundings of summer woods. They were first shown in Sculptural, William Benington Gallery’s biennial outdoor sculpture exhibition and are presented in the gardens at Cheeseburn throughout 2017.